Want to make readers love your content? As it turns out, there’s a formula for it – an exact mathematical equation that defines lovable content. To be more precise, the formula is for readable content. But content that people love and content that people can read is almost the same thing. The science-backed method I’m referring to is known as the Flesch readability score. 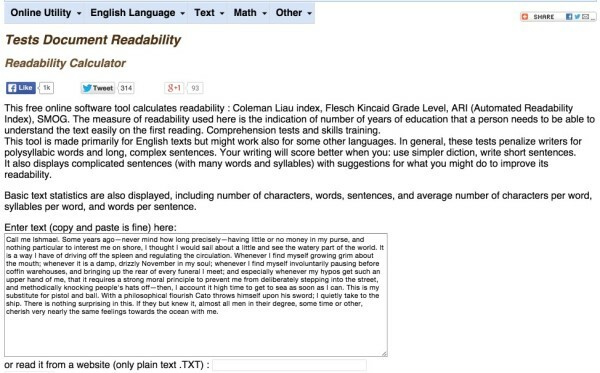 In this article, I want to explain the power of readability, and how you can release the powerful process of the Flesch readability score upon your content. If you absorb this content and implement it, you’ll discover a vast improvement in your content marketing, search engine optimization, and your conversion rates as well. It all starts with readable content. To whet your appetite, allow me to explain exactly why this is such a crucial topic. Without readable content, your content marketing, your website, and your overall approach to online content are doomed to failure. Readability is a critical component of SEO and usability. As search engines have evolved, so has the importance of readable content for SEO. It used to be that a few optimized articles on your website could produce a sizeable uptick in your search rankings. The web algorithms knew enough to crawl the content, index it, and rank it for the optimized keywords. Not anymore. Algorithms like Panda were designed to penalize low-quality content. When the algorithm was rolled out in early 2011, many sites experienced massive drops in their traffic and visibility. Many SEOs and webmasters were on the edge of despair when website traffic was trashed by the algorithm. Today, the algorithm is smarter. Google employs people whose job it is to read website content and grade it. Google feeds this information into the algorithm, which uses it to automatically rate content’s readability just like a real reader would do. Google’s information is contained in the often-leaked Quality Rating Guide. From this document, we know that Google cares about how expert, authoritative, and trustworthy content is. Right now, Google is indexing and rating your website. The readability of the content impacts how well or poorly your content will perform in the search results. There’s another reason why readable content is so crucial: Readers themselves. Who are the people who are accessing, understanding, processing, and interacting with your content? It’s real people who care about reading. Unreadable content is a huge turnoff. Thus, I’m a huge believer it not just content, but readable content. It matters, big time. Search engines love it. Readers love it. As a result of readable content, your business and your website become more profitable. 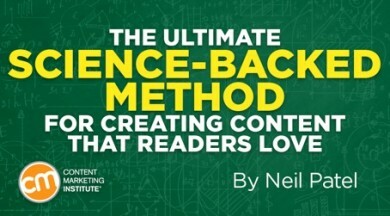 There is a math formula that will tell you if users love your content. It sounds too good to be true, I know. However, some very smart people have developed some highly sophisticated processes that allow us to score exactly how readable your content is. Allow me to introduce to you Flesch-Kincaid. “Flesch” is for Rudolf Flesch. He was an author and leader on readability. He developed a readability test in his 1951 book, How to Test Readability. “Kincaid” is for J. Peter Kincaid, a psychologist and scientist. He created a grade-level test for readability, originally developed for the U.S. Navy. The two tests are referred to as the Flesch Reading Ease, and the Flesch-Kincaid Grade Level. Why are these tests so important? In the 1970s, the military used these tests to score and develop training manuals. If recruits couldn’t understand the information, it wouldn’t be that useful. Realizing its importance, other government agencies caught on. Pennsylvania led the way, stipulating that insurance policies have a ninth-grade level readability. Educators, scientists, philosophers, psychologists, and other professionals have adopted and implemented Flesch-Kincaid standards and tests. In my opinion, content marketers should do the same thing – understand and apply the principles of Flesch-Kincaid readability and grade level. What are these mathematical formulas? There are two – one for Flesch Reading Ease and one for Flesch-Kincaid Grade Level. If the score is high, then the content is very readable. If the score is low, the content is harder to read. 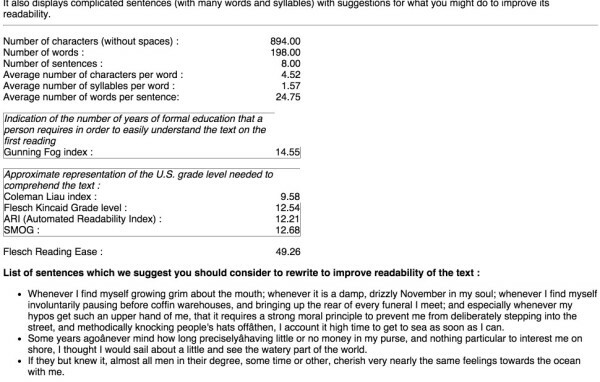 Short sentences equal a lower score. Short sentences are easy to read. Therefore, they produce lower scores. Short words equal a lower score. A word’s complexity is gauged by how many syllables it has. For example, “complicated” has four syllables, which means that it’s going to have a lower score. “Easy” has two syllables, thus contributing to a higher score. If you use long sentences and long words, your content will be more challenging to read. The Flesch Reading Ease Test assigns an arbitrary number to content. The Flesch–Kincaid Grade Level Test puts this number into perspective by assigning a grade level. The same features of the Flesch Reading Ease test are present in the grade level test – short words and short sentences make for lower grade levels. The various weighting of the features are different, however. For example, the Flesch Reading Ease test places a greater weight on multisyllabic words than the Flesch-Kincaid Grade Level Test. The grade-level test mostly applies to those who are familiar with the U.S.-based educational system. If, for example, a grade level number is six, then the content should be accessible, understandable, and readable by an average student in the sixth grade of a standard U.S. school. Example 1: The implementation of multisyllabic terminology produces challenging readability issues for those whose cognitive and educational readability tendencies are limited or underdeveloped. Example 2: Short words are easy to read. 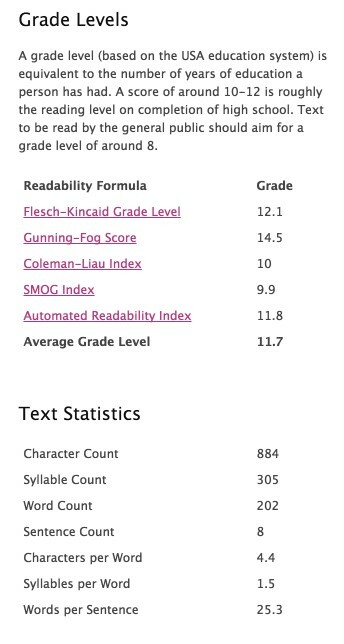 The Flesch-Kincaid readability and grade level tests are curious and intriguing, but can they really impact your content marketing? You should know who it is you’re trying to reach. Defining your target audience and creating a persona are the first steps. Along with this persona, you should create a list of the publications that the user typically reads. There’s a difference between niche media and popular media. To determine the real reading habits of your target audience, it’s important to understand their niche interests. For example, lots of people will read a website such as Forbes. To determine the real reading habits of your target audience, it’s important to understand their niche interests too. 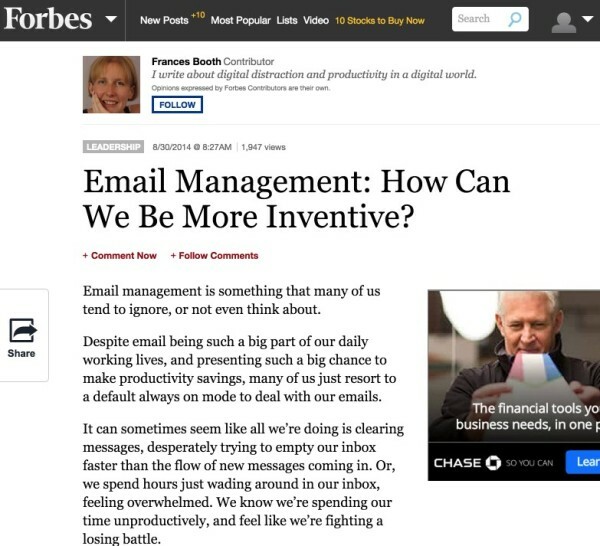 For example, someone in the water/wastewater industry may read a Forbes article that discusses email management. 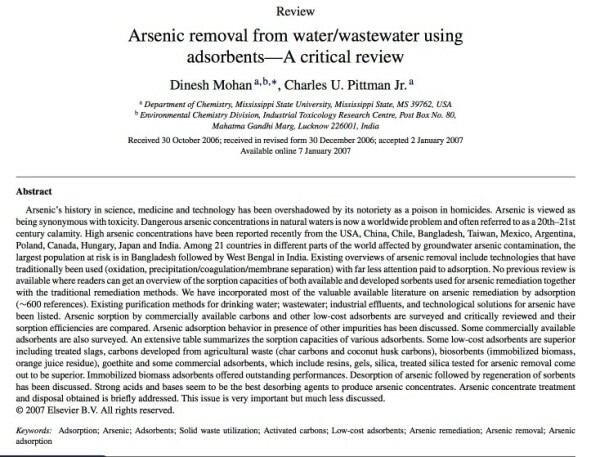 But this same reader also might be interested in an article from the Journal of Hazardous Materials. The purpose of identifying the media used by your target audience is to gauge the user’s grade-level or readability-ease score. When you can hone in on the right grade level or ease score, you can create content around the same level. If you create content that is way above the grade level, you’ll lose your readers. Create content that is way below the right grade level, and readers will feel that it is too simple for them. Use an average of the scores from your target audience’s preferred publications. This is your magic number. Use it as a rough range to score and assess your own content. You already know that short words vs. long words are one of the main determining factors in readability. Some of the same tools that display Flesch-Kincaid scores also show the average word length. Get a sense of the average number of syllables you should be using. Sentence length, another readability factor, should influence your writing approach. Find out the ideal or average sentence length for your target audience, and work to keep your sentences this length. Finally, run your own content through Flesch-Kincaid tests and see how you’re doing. It’s really helpful to get a sense of how your content scores, so do this regularly. Here are a variety of grading tools that you can use to assess your content. This tool automatically grades your content, and provides a quick readout of scores. A variety of other scoring and indexing formulas that it compels provides an “average grade level.” The tool also provides text statistics. 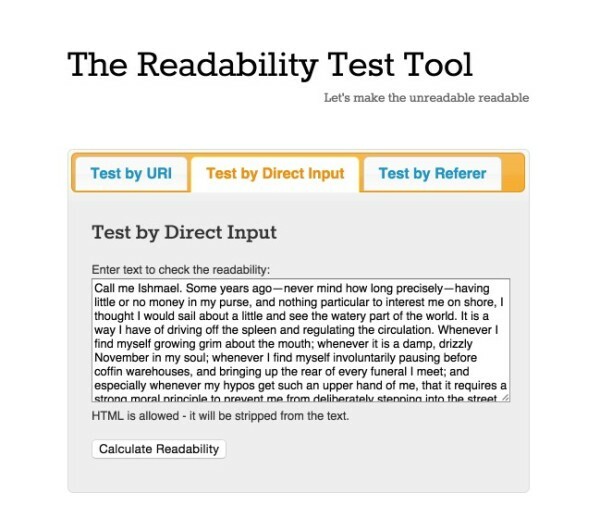 This tool can calculate readability by URL or copying and pasting the text. It features the same kind of information as Readability-Score – reading indices and text statistics. Read-Able provides an explanation and breakdown of each of the scores, which is helpful for learning more about your calculated score. Online Utility has a simple interface and an easy input method. You can input URLs but only plain text sites. One helpful feature of this tool is that it gives you a list of the sentences that you should edit to enhance readability. Readability doesn’t have to be a fuzzy and hard-to-define issue anymore. With some strategic insights and a few well-placed tests, you can be well on your way to creating content that is easy to read and understand. 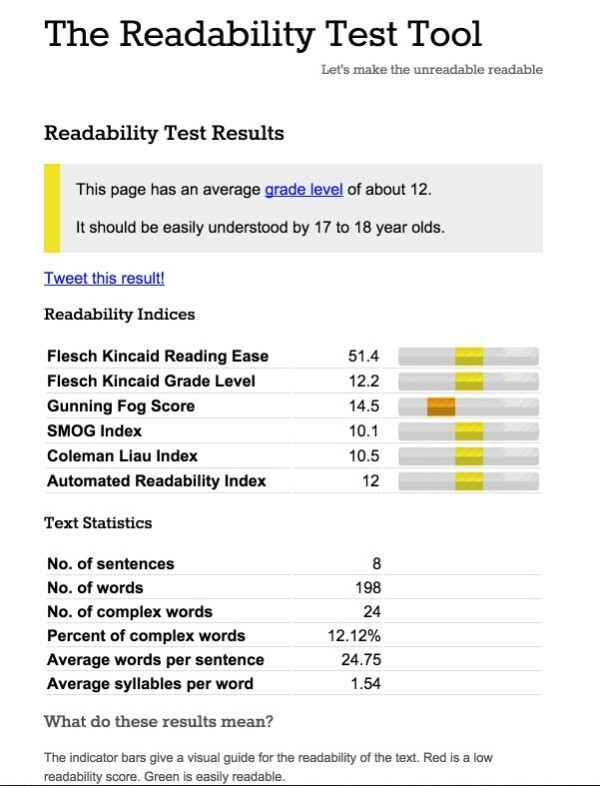 Have you used Flesch-Kincaid readability scores? What is your experience? Want to grow the love for your content year-round? Subscribe to the CMI blog for daily ideas and inspiration on content marketing.